Caspase-8, 9, 3, 6, PARP, and cleaved PARP were detected in POTEG overexpressed cells and control cells with or without STS treatment. Mol Carcinog, 2018, 57(7):886-895. Staurosporine purchased from Selleck. 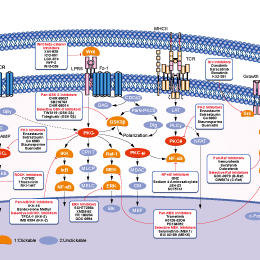 Intracellular concentration of HSF1-phosphoserine 326, total HSF1, S6 kinase-phosphothreonine-389, total S6 kinase and β-actin, without or with heat shock in HeLa cells pretreated with mTOR inhibitors rapamycin (30 nM) and KU0063794 (2 uM) and kinase inhibitor staurosporine (100 nM) for 2 hr. Relative levels of HSF1-phosphoserine 326 in cells after the various treatments were determined by densitometric analysis of X-ray films, normalized to untreated cells (lane 1), and are indicated below the representation of the immunoblots. PLoS One 2012 7(6), e39679. Staurosporine purchased from Selleck. J Biomol Screen 2013 18(4), 388-99. Staurosporine purchased from Selleck. Protein kinase C is assayed in a reaction mixture (0.25 mL) containing 5 μmol of Tris/HCl, pH 7.5, 2.5 μmol of magnesium acetate, 50 μg of histone II S, 20 μg of phosphatidylserine, 0.88 μg of diolein, 125 nmol of CaCl2, 1.25 nmol of [γ-32]ATP (5-10 × 104 cpm/nmol) and 5 μg of partially purified enzyme. The binding of [3H]PDBu to protein kinase C is determined: Reaction mixture (200 μL contained 4 μmo1 of Tris/malate, pH 6.8, 20 μmol of KCl, 30 nmol of CaC12, 20 μg of phosphatidylserine, 5 μg of partially purified protein kinase C, 0.5% (final concentration) of DMSO,10 pmol of [3H]PDBu (l-3 × 104 cpm/pmol) and 10 μL of various amounts of Staurosporine. Tamaoki T, et al. Biochem Biophys Res Commun, 1986, 135(2), 397-402. Meggio F, et al. Eur J Biochem, 1995, 234(1), 317-322. Kruman I, et al. J Neurosci Res, 1998, 51(3), 293-308. Tang D, et al. J Biol Chem, 2000, 275(13), 9303-9307. Deng X, et al. Proc Natl Acad Sci U S A, 2000, 97(4), 1578-1583. Johansson AC, et al. Cell Death Differ, 2003, 10(11), 1253-1259. Manns J, et al. FASEB J, 2011, 25(9), 3250-3261. Hara H, et al. J Cereb Blood Flow Metab, 1990, 10(5), 646-653.